I’m super excited for Quality Jam 2016 next week! Our first ever user conference is shaping up to be an amazing event with over 150 attendees and some great speakers. If you are interested in attending, tickets are still available. Visit QualityJam.com for more information. You can use the code QASVIP for a discount. If you need more incentive, every attendee will gets a cool Quality Jam t-shirt! Check it out. We’ll kick off the event at 8am with our CEO, Dave Keil giving his “State of the Union” address. Then we’ll go right into our keynote presentation with best-selling author Scott Berkun. 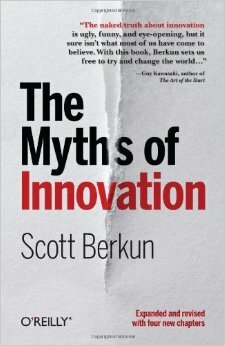 As a special gift to our attendees, we’re giving away copies of Scott’s book, The Myths of Innovation. Scott can even autograph it for you. After Scott, we will feature several panel discussions on agile development and testing featuring some great speakers like Ian Culling, CTO of VersionOne, Mike Cooper from IT Healthcare Leaders and Swati Jain from CPrime and Matt Heusser from Excellon Development. We will also have some of our favorite customers on the panels including George Garza from Manhattan Associates, Elise Carmichael from Mobiquity, Wendy Cotter from PowerPlan, Fred Furia from SevOne and Emily Byrnes from Heartland. This will give you a chance to hear directly from practitioners who are using our software every day. It is a good opportunity to learn and share best practices. During our lunch break, we’re going to feature short presentations from our awesome sponsors – KMS Technology, CPrime, VersionOne and Clearvision. You will get to learn about the solutions and services that they offer. All of our sponsors will also have tables setup near the registration desk. These are some of the top companies in their fields so I highly encourage you to check them out. We will also have a QASymphony “Genius Bar” where you can get some hands-on product support from our experts. The afternoon keynote will be our good friend Keith Klain. He will be speaking about making the transition from tester to leader. Keith worked his way up from the testing department to become a CEO so this should be a great session for testers who have leadership aspirations. If you’re interested in learning more about Keith, you can click here to watch our recent video Q&A. Another highlight of the afternoon will be the review of our 2016 product roadmap from our new CTO, Jonathan Alexander. This session will be one of the highlights of the day. Jonathan will be showing our new qTest Insights analytics platform as well as a new test management prototype that we’re building for the most progressive agile testing teams. We will end the day talking about test first methodologies – TDD, BDD and ATDD – with Adam Satterfield from BetterCloud and our VP of Strategy, Kevin Dunne. After final session, we’re hosting a reception with cocktails and hors d’oeuvres. We hope you can join us and toast to a successful conference.